[Editorial] Blu-Ray High Fidelity Pure Audio...here we again! If you're familiar with our magazine you already know our position on physical digital media. It suffices to look at the RIAA annual market reports to realize that the (good?) old Compact Disc seems doomed to disappear, not to mention the elusive SACD, which never really conquered the market. Instead, it seems LPs and music downloads are all the rage nowadays. The first ones owe their new youth to their coolness factor, while the second ones are quickly replacing physical media because music files are easier to store (hundreds of albums into a single hard disk!) and much more user-friendly than optical disks. For a moment, I won't discuss the differences in sound quality. Could the (Jurassic) Majors (i.e. record labels) avoid introducing another new digital media based on an optical disk? No, they couldn't. Like dinosaurs, they believe there's still room for optical disks! 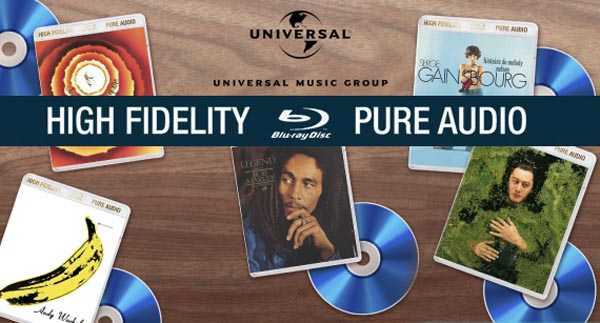 This is why the Universal Music Group, following the 2L audiophile label example, has just launched the, hear hear!, Blu-Ray High Fidelity Pure Audio disc, which is a Blu-Ray disc containing high resolution audio only (24/96 and maybe even up to 24/192). Multichannel audio is also an available option. No, you won't need another digital player as any Blu Ray device will make these new discs spin. UMG estimates 100 new titles before the end of 2013. Wow. The good news is that we could purchase our N-th version of The Dark Side of the Moon! We already have it in standard vintage vinyl, in 180grams high-quality vinyl, in CD, HDCD, SACD and all the strictly necessary limited editions of these. Ridiculous, to say the least. By now few titles are available: Rolling Stone's Grrr! (introductory price: 14€! Hurry while supplies last! ), Velvet Underground's The Velvet Underground & Nico and the usual hits from Bob Marley, Stevie Wonder, Dire Straits, Queen etc. The Universal spot tells us this new disc allows for a dynamic range of 144 dB (!!!!) but, in order to enjoy its extreme audio quality, even your daughter's PlayStation3 will suffice. Now, let me put this straight: a REAL dynamic range of 50 dB is already too much of a good thing in a standard listening room. It means that if the noise floor of your room is, say, 50 dB, you can reach peaks of 100dB at the listening seat. Thrilling, at least for our neighbors! Moreover, someone at UMG should tell us where, on Earth or elsewhere, we can purchase recordings with a dynamic range so wide. Thanks to the loudness war (thank you Majors!) new recordings have an average dynamic range of 10 dB or less. What's the point then? They're giving us bigger and bigger boxes to contain smaller and smaller things. Imagine a toothpaste tube large as a cruise ship that still contains the usual 75ml dentifrice. Yes, a disc that can contain files with 144dB of dynamic range, it's capacity wasted to store files that, if you're lucky, can't exceed 20 dB. And don't forget: it's a LOGARITHMIC scale!!! To make things even more silly, have a look at the titles: old recordings, normally based on compressed analogue master tapes (because they had to go on vinyl!) which sounded bad even 30 years ago (for example, Velvet Underground's album, a quite compressed and bad sounding record). If this isn't like The Emperor's new clothes tell me what is. I'm getting sick of the Majors behaviour: haven't they noticed we're not a bunch of idiots always ready to open our wallets and happily purchase and drink their latest marketing potion? Do they really wish to attract music lovers interest or is their sole interest our money? A far better approach would have them give the listener true quality and excellent material recorded with attention to fidelity: Not a rehash of the appalling Loudness wars. Give music lovers good (new!!!) music and good recordings. We don't judge a book by the cover. Give us some real content, not just marketing hype.